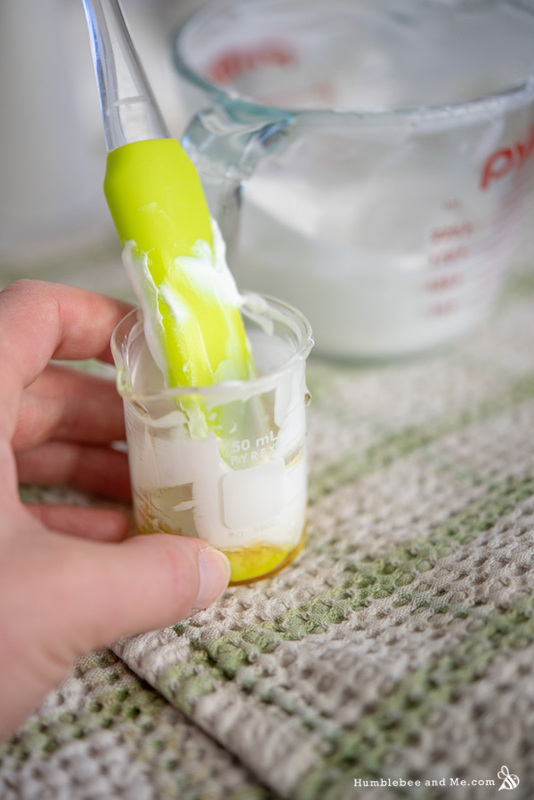 To ensure it was lightweight and fast-absorbing I kept out oil phase quite small, adding a titch of cetyl alcohol to keep it from being drooly. Camellia seed oil and jojoba oil are both light, fast-absorbing oils, so that further contributes to the lightweight-ness of the lotion. 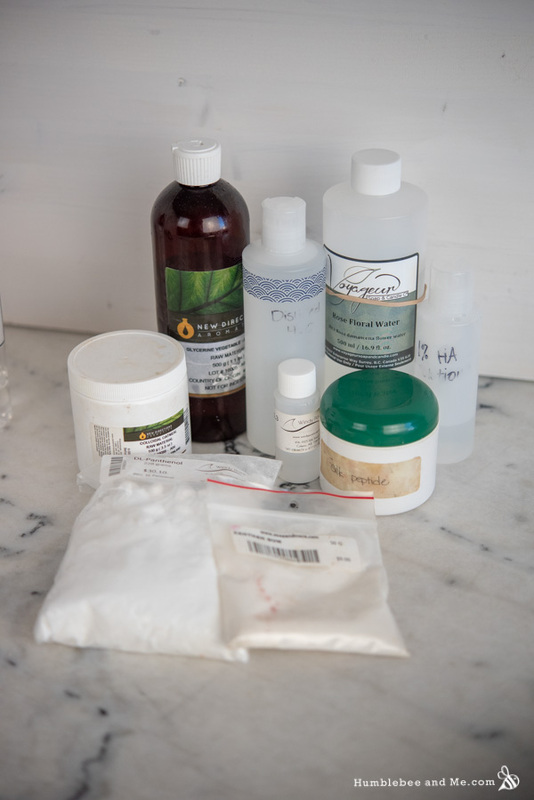 Our water phase is packed with humectants—vegetable glycerin, propanediol, and some fancy hyaluronic acid. Colloidal oatmeal and panthenol are both sooth and moisturizing, and silk ups the moisturizing factor and sounds really fancy (label appeal is a consideration in product design, after all!). The essential oil blend is lovely, and I’m really proud of it. The sweet rose hydrosol mingles with warm, vanilla-like benzoin, and both are lifted up by a touch of spicy cardamom and juicy, fresh grapefruit. It’s not an easily identifiable blend; everyone I’ve asked has been able to catch a note or two, but nobody has been able to identify all the parts. The scent is complex and beguiling; luxurious and mysterious. It starts off bright and a bit sharp before mellowing down to a warm, sweet hum. 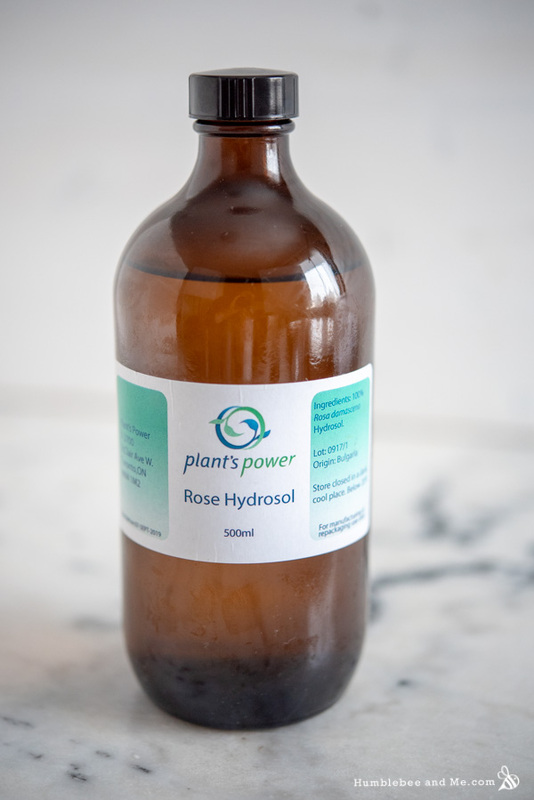 The rose hydrosol I’m using today is from Plant’s Power in Toronto, and it is absolutely lovely. It is a true hydrosol—a product of distillation, not an essential oil solubilized in water. The rose scent is rich and velvety, with an almost juicy-ness to it. Beyond the rich scent, two things I’m really appreciating are that the hydrosol came in a heavy, dark glass bottle, and that I can download a Certificate of Analysis from the Plant’s Power website that includes a precise date of manufacture, so I know the hydrosol is fresh. Plant’s Power sent me the rose hydrosol along with a few other things I’ve really been enjoying working with—so far I’m very impressed with their quality. The scent is a big part of what inspired the name—Pemberley. Pemberley is the name of Mr. Darcy’s estate in Jane Austen’s Pride & Prejudice. When I was trying to think of a name for this lotion I wanted something evocative of old-fashioned British luxury; manicured rose gardens, satin slippers, full skirts, and heavy wood furniture on richly carpeted floors. Pemberley perfectly encapsulates that for me. In keeping with Formula Botanica’s natural ethos I used Optiphen Plus to preserve this lotion. This preservative can de-stabilize emulsions, so to counter that I included 0.3% xanthan gum and 2% cetyl alcohol to stabilize the emulsion. The pH of the final product also needs to be below 6; when made as written it is approximately 5 without any adjustment (which is perfect). The finished lotion is stunning. It has a gorgeous, cool, glidey slip that makes it an absolute pleasure to apply. The scent is intoxicating and indulgent. The finish is light, without a hint of greasiness or tack, and my skin is left soft and hydrated for ages. 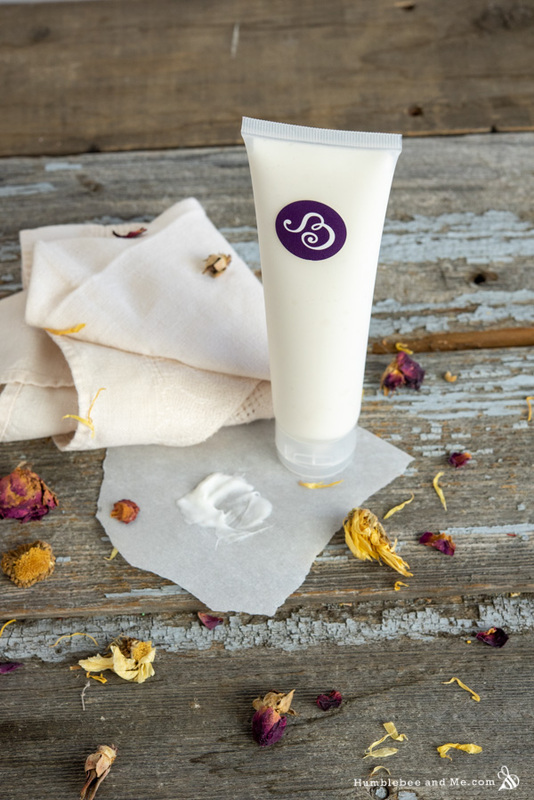 I am so in love with this Pemberley Hand Lotion, and I hope you will be, too! 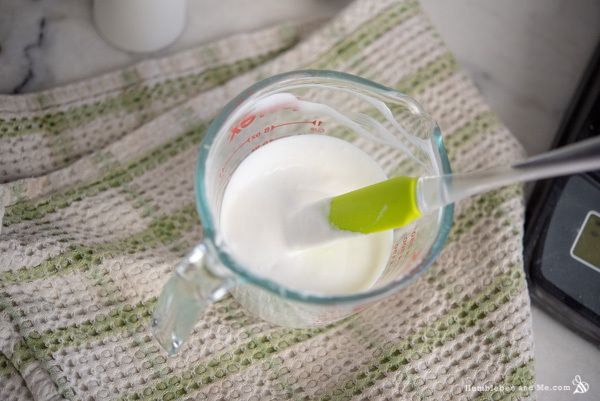 Whisk the xanthan gum and glycerin together in a small heat-resistant glass measuring cup, breaking up all lumps of gum. Whisk in the water, and then add the rest of the heated water phase ingredients. 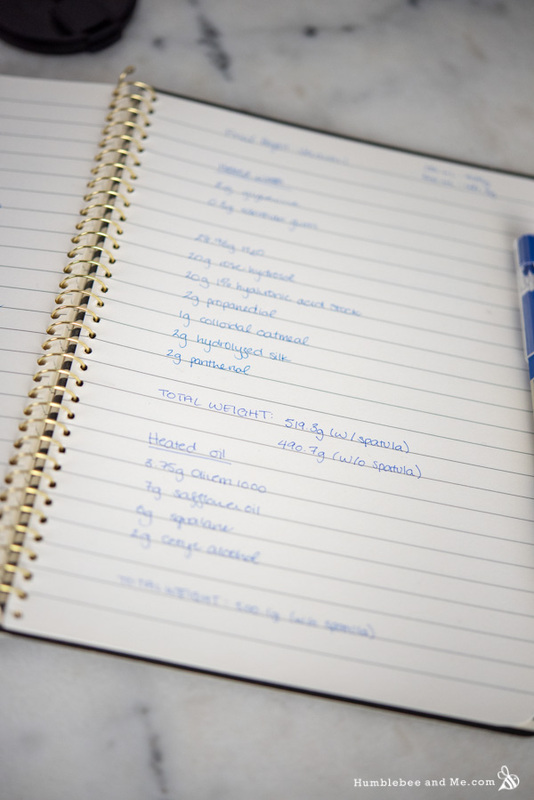 Weigh the entire lot (measuring cup + ingredients) and note that weight for use later. 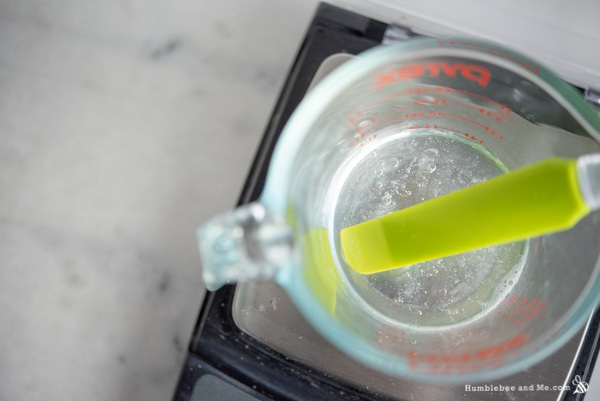 Weigh the heated oil phase into a second heat-resistant glass measuring cup. 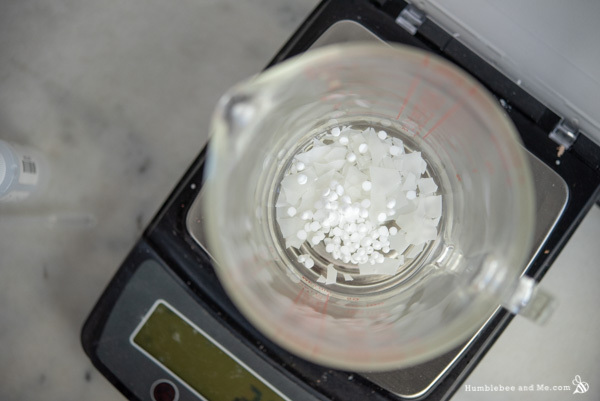 Place both measuring cups in your prepared water bath to melt everything through. When the lotion is cool it’s time to incorporate our cool down ingredients. 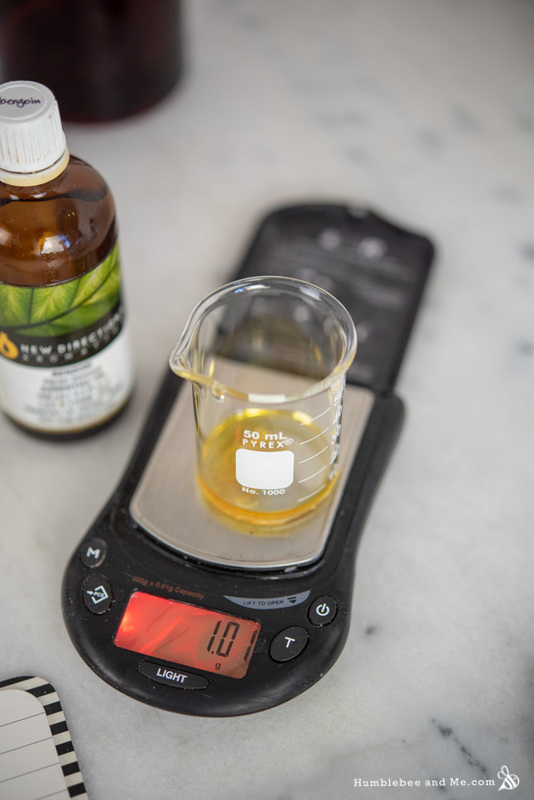 Because cool down ingredients are typically present at very low amounts you’ll need to use an accurate scale—preferably one accurate to 0.01g. 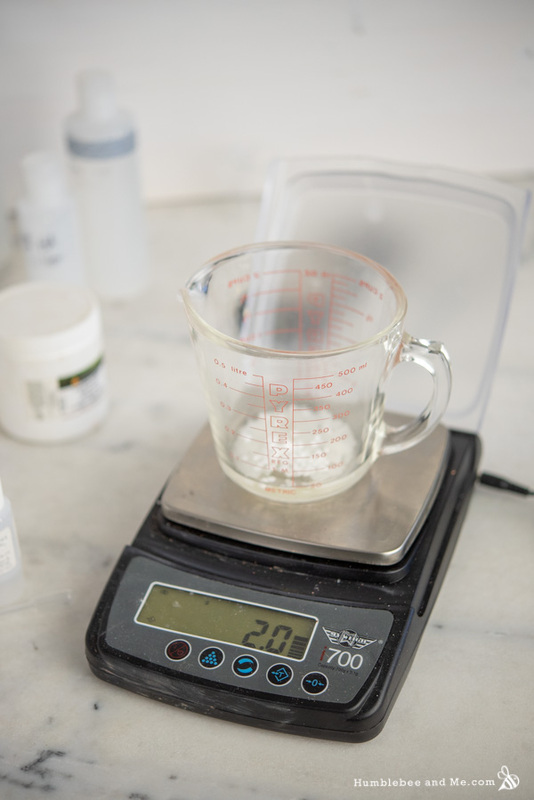 As these more accurate scales tend to have fairly low (100–200g) maximum weights you won’t be able to put the entire batch of lotion on that scale without blowing it out. 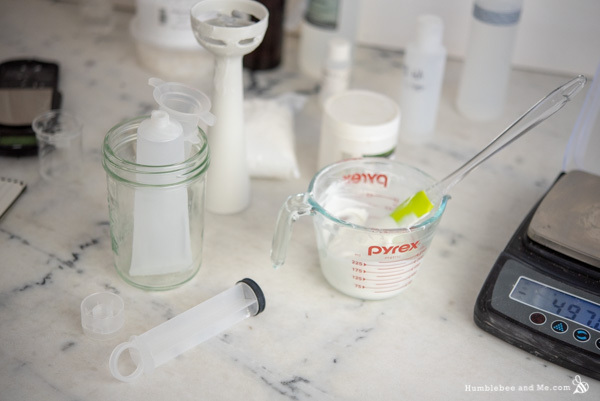 Because our preservative is more pH-sensitive than the one I usually use (it requires a range of 4–6), you’ll want to test the pH of the lotion to ensure it is compatible. Skin Chakra has an excellent post on how to test and adjust pH, which you can find here. If made as written this lotion should naturally have a pH of approximately 5. It is a good idea to test the pH before and after the addition of the preservative to ensure compatibility. Weigh the cool down ingredients into a smaller dish using your more precise scale, and then add a scoop or two of lotion. 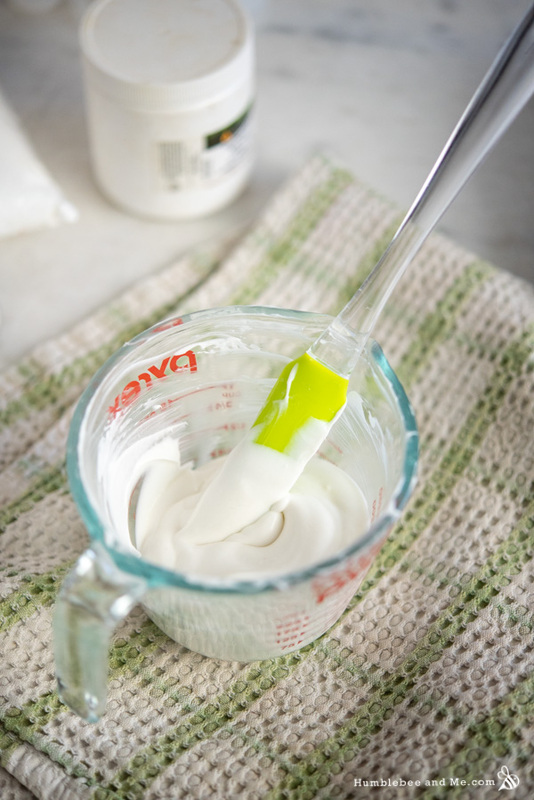 Stir to thoroughly incorporate, and then stir all of that back into the master batch of lotion. Doing it this way minimizes the amount of cool down ingredients lost to the secondary container. Once the lotion is totally cool it’s time to package it up. I designed this lotion to be stored in a squeeze tube, like this. A 100g batch will fill a 100mL (3.3fl oz) tube pretty well. I use a syringe to fill tubes—I find that’s the easiest way. Watch the video to see how I do it! Once the lotion has been packaged up, you’re done! 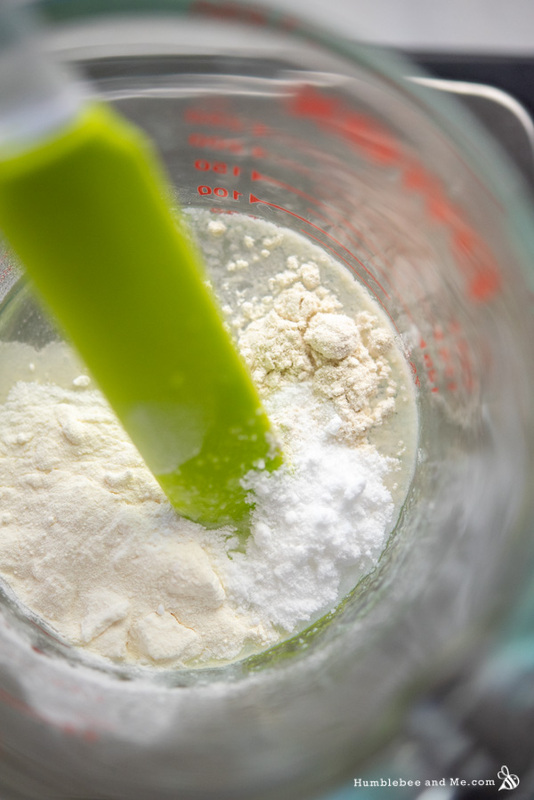 You can eliminate the xanthan gum, replacing it with more water. You could also try a different gum, like guar gum or hydroxyethylcellulose. I don’t recommend swapping out the hyaluronic acid; if you have to please read its encyclopedia page for some ideas. Glycerine and propanediol 1,3 are our humectants. You could try replacing either or both with a different humectant, like sodium lactate. You could replace the colloidal oats with more panthenol. You could use a different complete emulsifying wax instead of Olivem 1000; Ritamulse SCG would make the most sense. DO NOT use Olivem 300. Cetearyl alcohol will work as an alternative to cetyl alcohol. You can substitute another lightweight oil like sweet almond, grapeseed, or sunflower seed for the camellia and/or jojoba oil. This is also a good place to use more luxurious carrier oils like argan oil! You can use a different botanical extract in place of calendula, or simply use more water. I don’t recommend altering the essential oil blend as it is stunning, but if you have to be sure to 1) keep in mind there is rose hydrosol in the recipe, and that impacts the scent and 2) maximum usage levels. You could also use a fragrance oil. The rose hydrosol was gifted by Plant’s Power.The hyaluronic acid was gifted by Pure Nature. It’s considered more “natural”. You can certainly use LGP instead! Hi! optiphen plus isn’t considered a natural preservative…or so I thought. Phenoxyethanol is an ethoxylated compound and its source as found in cosmetic use is petrochemical. Formula Botanica doesn’t normally use petrochemical ingredients even for preservatives? Well I may be wrong or not updated. Love to learn more though. That was my understanding too. It was in the Formula Botanica syllabus that phenoxyethanol is not natural and used in their formulation with clays only since clays are “notoriously hard to preserve” (the exact quote by FB). And I remember that points were deducted for using this in assignment. FB could have bended their ethos on a case by case basis. Now I am absolutely curious and would like to know too. This is what my tutor said: “Another thing is that Phenoxyethanol is no longer accepted in organic certification but as you didn’t mention your market is all about certified organic, I think it is fine. We don’t use it in our courses ( unless it is about clays) but it is still an effective preservative.” I hope that is helpful! I am not a fan of rose scent. Can you suggest a different hydrosol that would be scent compatible? I love the benzoin & cardamom mix from the plum oil series and I LOVE the idea of adding grapefruit to that mix. . .
Hmm. Maybe lavender? You could also use distilled water instead and swap out some of the oils in the lotion for plum oil…. ooooh…. now I want to try that! It appears as if there is a world-wide shortage of panthenol. I bought about 50 pounds or so of it when I could tell that it was becoming unavailable, and I haven’t been able to find a source for it since then (last summer) Any ideas on a good source for it in the US? Oh, I’m a little older (47) but this meets all of my hand lotion needs, and I have everything on hand (I’ll need to sub out some of the essential oils). I’ll make this up this weekend. Thank you so much! The marketing talk is just plain ol’ marketing talk 😛 It helped guide the formulation, but that’s about it. I’m not in the target market for this lotion, either, and I love it! 🙂 Happy making! This formulation sounds wonderful and I can see why you received full marks, Marie! I’m going to try it for sure. Since I’ve never seen you use them, I just wanted to say that when I’m making hand lotions for gifts, I’ve started putting them into silicone squeeze tubes that I get from the dollar store. They are wonderful because they are refillable and have a wide mouth for easy filling. If I’m making a big batch, I use a 1L zipper bag and cut the corner off to fill the tubes. I use a little bulldog clip to seal if I don’t use all the lotion at once. I can’t wait to try this lotion! Thank you! I have used similar silicone tubes in the past, but I find they are very… not photogenic, lol. They are fantastic for projects you don’t need glam shots of, though 😛 I often use them when I travel to bring along a small amount of laundry detergent! Sounds amazing! I have most of the j gradients but not all 🙁 I guess my carts are going to get bigger today. You get your Hyaluronic Acid from lotioncrafters right? The one I’ve worked with is LMW and it very definitely gels—I’m excited to try the SLMW and see if there’s a possibility for an even more concentrated stock! Love this one and can’t wait to try it! I am wondering about the use of humectants in lotions as I live in the desert of Arizona where skin is always dry. I remember reading(but not where) that in very arid climates humectants actually steal water from the lower layers of the skin. That doesn’t sound good! Not sure if I should use them or not. Any advice? Thanks so much! Hey Connie! Generally speaking, this is how all humectants work, but theft isn’t a good way to think of it 🙂 In the skin, the dermis is the last layer that is vascularized—meaning it’s the last layer the body can deliver water to. On top of the dermis we have the epidermis, and it tends to need some help staying hydrated, especially in dry conditions. 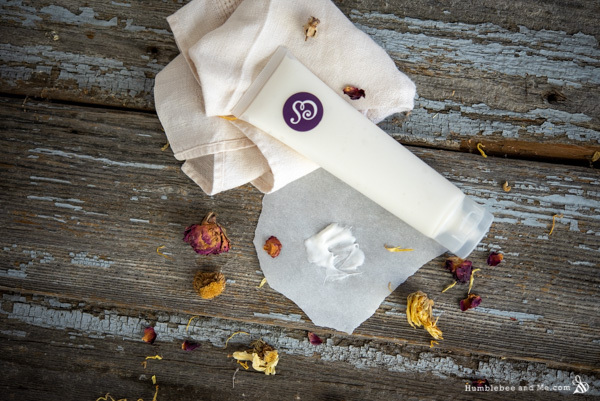 The application of moisturizers including humectants helps topically replenish moisture, hold onto the added moisture, and pull moisture up from lower layers of the skin, but that moisture is easily replenished by the body. So maybe not theft, but facilitated sharing? 🙂 Definitely embrace the humectants, your skin will love ’em! I live in a very dry environment as well and I humectant all the things! I can see why you got 100% This is a wonderful lotion. I made it with just a couple of substitutions as I did not have everything on hand. It turned out beautiful, not greasy. oh this looks lovely! Is it ok for professional women between 50 and 60 🙂 lol! Really, it looks divine. Thank you for sharing. I made this lotion exactly as posted. OMG, OMG…the scent…heavenly. The best combo yet and the lotion is so …so…so…I can’t even describe how satiny smooth it is. THANK YOU !! I find the rose hydrosol (a distilled product) loses quite a bit if odour when heated. Do you find the same thing ? I’ve found the scent loss varies with different hydrosols—some seem relatively unharmed while others positively vanish :/ We can’t really add 20%+ of the recipe in the cool down phase, though, so I would probably just use more in the heated phase, reducing the water accordingly, if you’re finding the scent from the hydrosol is insufficient. Good idea about reducing the water and adding the reduced amount to the hydrosol. I’ll try that ! This sounds wonderful. Thanks for sharing it. I also love the sticker you put on the tube. Can you post the source for them? Thanks! Thank you! The sticker is one of my own design 🙂 You can see the full project here! The vitamin E is used at 0.5% of the oil phase, which is what I usually do 🙂 The oil phase in this formula is pretty small, though, so that means there’s really not much vitamin E.
I just finished a batch of my own hand cream and it’s scented with Lavender, Lemon, Frankincense and Myrrh. I love it and it so rich and good for your hands. I have to tell you that I made a batch of your Frankincense and Myrrh lotion(alas I converted the grams to tablespoons and teaspoons: my gram scale is on it’s way) and it turned out beautifully! I also made another batch and decided to use some alkanet infused olive oil and scented it with Lavender, Lemon and Ylang Ylang. It’s a very pretty rose color and smells heavenly! Thank you so much, Janice! I’m so glad you’re enjoying the lotion—your scent blend sounds utterly divine. Swoon! I love the alkanet infusion idea as well—did you know alkanet shifts colour in different pH environments? Plants are so cool! I really love this one! At first all I could think was “xanthan gum = boogery”. And sure enough my first impression was eeeewwww slimy! But after it fully cooled and set, it had the most lovely non greasy consistency – almost a gel. While this batch was setting, I decided to make another batch, this time with crothix instead. Although it came out quite nice, I did end up preferring the batch made with xanthan gum. I’d like to say it’s sitting on my desk right now, but one of my coworkers has claimed it as her own! Thanks Marie! I am SO glad you’re loving it! You are definitely right—the xanthan does give it an extra slippy-ness that my other lotions don’t have. I was surprised by how much I liked that! And I’m glad to hear it is right at home in an office setting, ha 😛 Mine is happily living on my side table next to where I do most of my writing. Thanks for DIYing with me, and thank you for being a patron! Thank you for sharing, Marie. 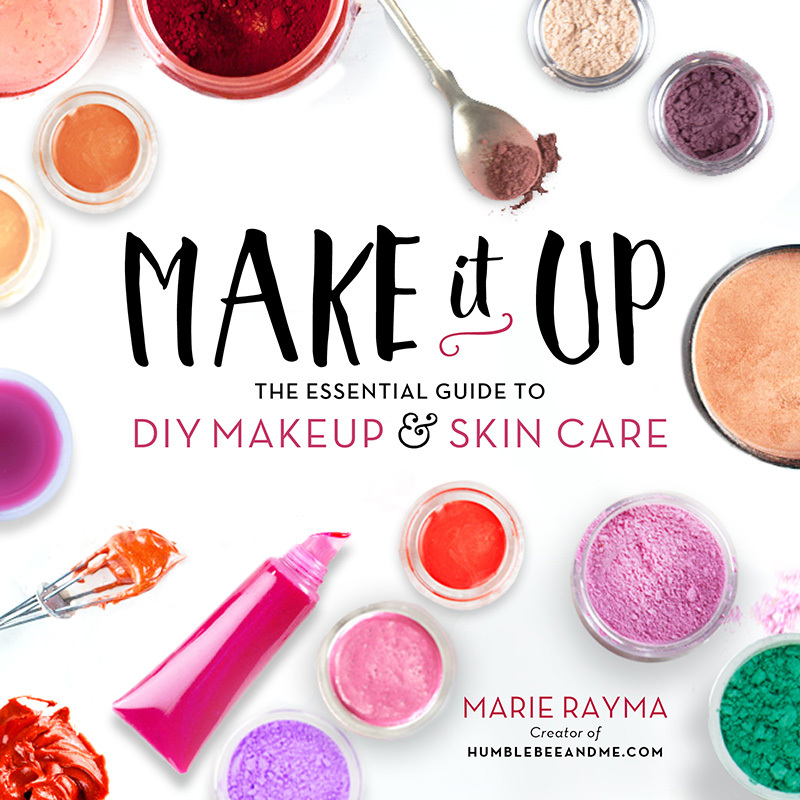 I’m new to making DIY creams and lotions and it was very helpful to follow the recipe. However I used other essential oil blend, because the benzoin I have is very sticky and thick, where did you get yours? How can I dilute mine so I can work with it? You can put your bottle in hot water so that the benzoin becomes more liquid. Then it is possible to get the drops out. One of my benzoin resins is also wickedly thick and blob like! What I do when I need to use it, is heat it up gently in a cup of hot water so I can get a more accurate amount. My other container of benzoin is VERY liquidy! I bought mine here. Pemberley Lotion was made this morning BEFORE work! That is how easy it all came together. It was my first time working with colloidal oatmeal and I am in love. I did swap out some things for what I had on hand. Emulsifying Wax NF, for the Olivem. Monoi oil for the Camellia seed oil. I did not have Xantham gum so I used a bit of Stearic acid. I also have a dry spot on one hand so I sprinkled a bit of Urea in the mix. I love it. I really do and the Monoi oil gave it a luxurious tropical scent that blended well with the rose and other scents you created. It smells like an English Garden was planted next to a Gardenia garden surrounded by a coconut groove with one singular Cardamom in the center. Thank you so much for this recipe. My hands feel great and moisturized.